Two North-American investment companies were the biggest purchasers of SPDR Gold Trust-shares in Q1’2015. The US Securities and Equities Commission (SEC) has released brand new numbers of the major US-asset management companies‘ asset holdings. The data allows to extract single investors of the world’s biggest gold-ETF, SPDR Gold Trust (Ticker Symbol: GLD), as well as changes in ownership compared to the previous quarter. According to the data, Paulson & Co. remains in first place of major investors in this gold fund. US-billionaire John Paulson’s fund held on to its shares, most recently worth $ 1.2 billion. Canadian asset manager CI Investments Inc. was by far the biggest purchaser in Q1. The company increased its GLD-positions by 6,117,900 shares and hence soared on to second place in the major share holders‘ ranking. The investment value: $ 735 million – which corresponds to 7.7 percent of the entire portfolio of this major investor, and also was the biggest single holding of this company in Q1’2015, an even bigger position than shares of Apple Inc. ($ 626,67 million). Investment group DE Shaw & Co., founded by computer scientist Dr. David E. Shaw, who also works as a consultant for science and technology for the Obama-adminstration, secured 2,033,000 shares worth $ 238.9 million. The GLD-share on the company’s total portfolio was close to 0.5 percent per end of March. Lazard Asset Management LLC has added another 1 million shares and thus almost doubled its GLD-shares. Credit Suisse (+490.83 %), Morgan Stanley (+18.26 %) and Blackrock Group (+167.44 %) have also clearly increased their holdings. 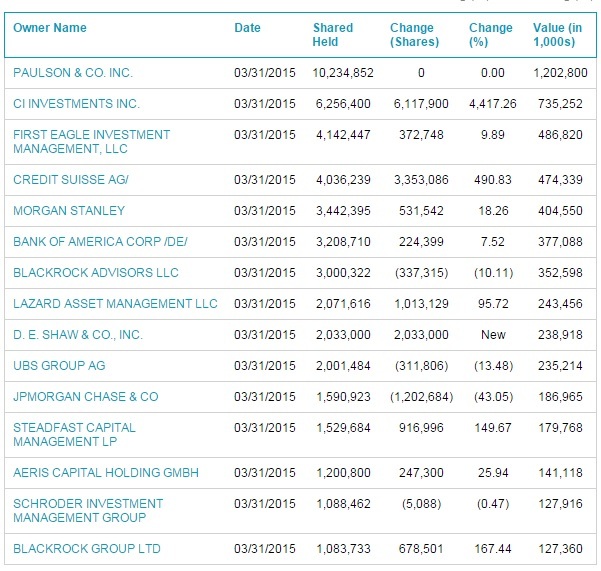 They are all listed in the top-15 of the major GLD-investors (see spreadsheet above). But there have also been major sell-offs. Abu Dhabi Investment Council sold off all of its 2,278,463 shares, JP Morgan dropped 1.2 million shares (- 43.05 %), and Barclays (- 78.52 %), Royal Bank of Canada (- 40.9 %) and Goldman Sachs (- 27.1 %) were also on the selling side. Major asset managers use traded gold ETFs (Exchange Traded Funds) to invest in gold in a convenient way. 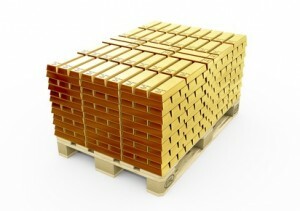 But the SPDR Gold Trust-shares only represent a claim on gold, though the securities are backed with physical gold. Das wären dann in 2 Monaten etwas mehr als 200 Tonnen Gold. Did anyone try calling the GLD hotline in search of numerical details on GLD’s insurance? The prospectus vaguely states „The Custodian maintains insurance with regard to its business on such terms and conditions as it considers appropriate which does not cover the full amount of gold held in custody.“ When I specifically asked for clarification on this clause and about how much of the gold was insured, the representative proceeded act as if he didn’t know and said they were just the „marketing agent“ for GLD. What kind of marketing agent doesn’t know such basic information about a product they are marketing? It seems like they are deliberately hiding information from investors. I remember there was a well documented visit by CNBC’s Bob Pisani to GLD’s gold vault. This visit was organized by GLD’s management to prove the existence of GLD’s gold but the gold bar held up by Mr. Pisani had the serial number ZJ6752 which did not appear on the most recent bar list at that time. It was later discovered that this „GLD“ bar was actually owned by ETF Securities. I’ve always suspected GLD of gold hypothecation but saw no real evidence until that visit. The lack of insurance is also incredibly convenient for bullion lending.